Mind Your Biscuits, the brilliant Grade I-winning sprinter who finished second to Diversify in Saratoga’s Grade I Whitney in his first race beyond one mile, will attempt to land his first win around two turns and a possible spot in the Breeders’ Cup Classic when he headlines a field of eight older horses in Saturday night’s sixth running of the $200,000 Lukas Classic Presented by Budweiser (Grade III) at Churchill Downs. The 1 1/8-mile Lukas Classic for 3-year-olds and up, which honors the iconic 83-year-old Hall of Fame trainer D. Wayne Lukas, is the centerpiece of an 11-race “Downs After Dark” evening program – the final nighttime card at Churchill Downs this year. Three other stakes events are showcased on the card: top milers in the $100,000 Ack Ack (GIII); 3-year-olds in the $100,000 Jefferson Cup (Listed) at 1 1/8 miles on the Matt Winn Turf Course; and purebred Arabians in the $100,000 President of the United Arab Emirates Cup (GI) over 1 1/16 miles. Saturday night’s first race is 6 p.m. (all times Eastern) and the Lukas Classic will go as Race 9 at 10:11 p.m. Mind Your Biscuits made international headlines in March when the 5-year-old son of Posse scored his second consecutive win in the Dubai Golden Shaheen (GI) on Dubai World Cup night at Meydan Racecourse – his fifth graded stakes win and third against Grade I company. With the victory, he surpassed 2003 Kentucky Derby winner Funny Cide as the richest New York-bred of all-time. Life has been gravy for the ownership group. Mind Your Biscuits has seven wins, 10 seconds, a trio of thirds and earnings of $4,159,286 from 23 starts over the last four years for the partnership of Shadai Farm, J Stables LLC, Head of Plains Partners LLC, M. Scott Summers, Daniel Summers, Chad Summers and Michael Kisber. Also, the horse will be sent to Japan for stud duty at the end of his racing career. After back-to-back third place finishes in the last two renewals of the six-furlong TwinSpires.com Breeders’ Cup Sprint (GI) and the narrowest of losses to Bee Jersey in the one-mile Metropolitan Handicap (GI) on Belmont Stakes Day, trainer Chad Summers set his sights on testing Mind Your Biscuits over a route of ground. When he finished 2 ¾ lengths back of fellow New York-bred Diversify in the Aug. 4 Whitney over 1 1/8 miles – his first race beyond one mile – Mind Your Biscuits beat six other accomplished horses. Saturday’s Lukas Classic performance, however, will determine which Breeders’ Cup race Mind Your Biscuits will target on Nov. 3 at Churchill Downs. “Obviously to win the Classic would be a big deal but we’ll see what happens after the Lukas Classic,” Summers said. Rising star and Florida-based jockey Tyler Gaffalione will take over the riding duties on Saturday from Joel Rosario, who is booked to ride top Classic contender Accelerate in the $300,000 Awesome Again (GI) at Santa Anita. Mind Your Biscuits will break from post position No. 6 in the field of eight and was made the even-money favorite on Mike Battaglia’s official morning line odds. The complete Lukas Classic field from the rail out (with jockeys, assigned weights and morning line odds): Honorable Duty (Corey Lanerie, 121, 5-2); Remembering Rita (Alex Birzer, 123, 15-1); Rated R Superstar (Brian Hernandez Jr., 123, 12-1); Toast of New York (Julien Leparoux, 121, 15-1); Flowers for Lisa (Jose Ferrer, 121, 15-1); Mind Your Biscuits (Gaffalione, 121, 1-1); Term of Art (Shaun Bridgmohan, 121, 10-1); and Breaking Lucky (Ricardo Santana Jr., 121, 6-1). Honorable Duty (19-8-5-1—$937,396), owned by David A. Ross’ DAARS Inc. and trained by Brendan Walsh, is the defending 4 ¾-length Lukas Classic champ, and the 6-year-old gelded son of Distorted Humor will make his first start since finishing second to Pavel in the $500,000 Stephen Foster Handicap Presented by GE Appliances (GI) on June 16. Flying P Stable’s 5-year-old gelding Flowers for Lisa (40-10-10-5—$396,616) has won three of his last four starts for New Jersey-based high-percentage trainer Jorge Navarro and figures to be a factor in the early pace. Al Shaqab Racing’s Toast of New York – the oldest horse in the field at age 7 – has added international intrigue to the lineup. The Jamie Osborne-trained gelding arrived from England on Tuesday and will make his first start since finishing last of 12 in late January’s Pegasus World Cup Invitational (GI) at Gulfstream Park. It was just his second start since finishing a nose back of Bayern in the 2014 Breeders’ Cup Classic (GI) at Santa Anita. D. Wayne Lukas, the four-time winner of the Kentucky Derby and Kentucky Oaks and conditioner of 26 Eclipse Award-winning champions who has been based at Churchill Downs’ Barn 44 since 1989, is expected to be on hand to present the trophy to the Lukas Classic’s winning connections. Presented by Budweiser, the theme for Saturday night’s Downs After Downs event is “Bourbon & Beats.” Guests are encouraged to wear shades of purple and stay on trend with autumn fashion as they celebrate a pairing of Kentucky sounds and spirits. Admission gates open Saturday at 5 p.m. and the final race of the evening is scheduled for 11:10 p.m. General admission is $10 and reserved seat packages start at $25, which are available for purchase on www.ChurchillDowns.com. The National Weather Service forecast for Louisville calls for sunny skies with a high near 69. 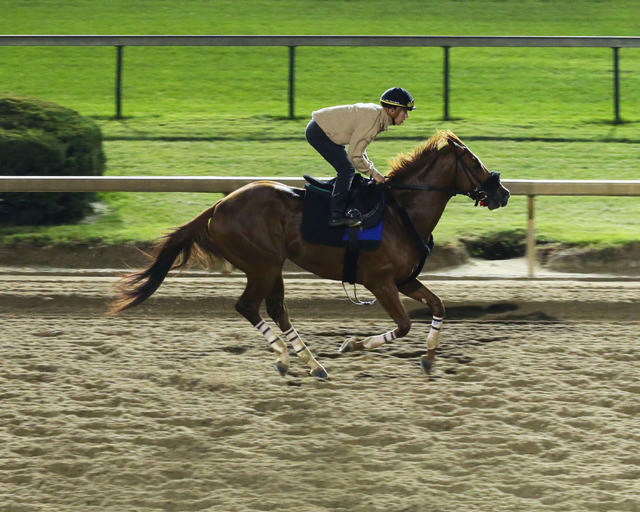 Saturday is the penultimate day of Churchill Downs’ 11-date September Meet. Closing day is Sunday.